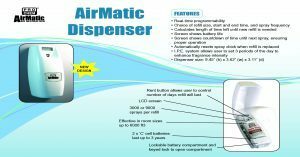 AirMatic Dispenser | Pro Chem, Inc. Install dispenser at a minimum height of 6 ft 6 in. Use the key to open hatch. Insert 2 ‘C’ batteries, observing correct orientation. 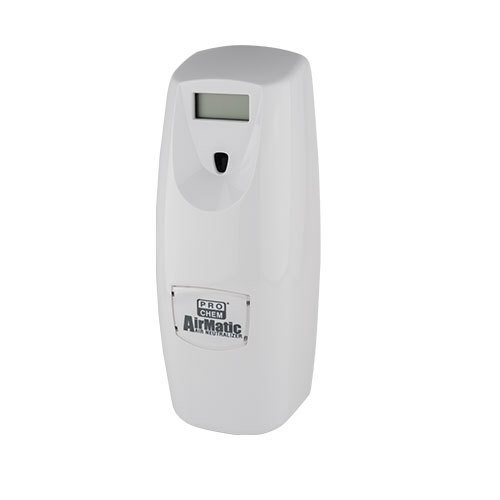 Install AirMatic or Ultra Air refill, ensuring that it is inserted firmly in the unit. The unit will only operate when a refill is in place. Press power button. Display will appear in LCD screen. If factory settings are satisfactory, no further action is required. Optional: Go to rental options (press RENT) to set program based on number of days the refill will last. When programming is complete, LCD screen will scroll through all options selected. If you selected the start time as earlier in the day than the current time, the dispenser will not begin running the program until the correct start time on the following day. To review selected options press and hold PROG button for 5 seconds. In normal operation, LCD screen displays time to next spray. Replacing an empty refill with a new AirMatic refill automatically resets the system. When batteries are replaced, unit will revert to factory settings.